That looks really good! I really like the stuffing and sauce. i could totally go for these right now! looks so good! I love samosas! They look amazing Lisa! These look very tasty. Love the spicy mint sauce. I love samosas and I think yours look really professional Lisa! I bet that spicy mint sauce provided a refreshing kick to your taste buds. Delicious! I just bought frozen at Costco and they were so good, now I'm wanting to try to make them at home. And with your post, it sounds like it was meant to be. They look really delicious Lisa. Nice job. I have not eaten Samosas in a long time but love them. They look relish. Great picture! I haven't had samosas since I attended a wedding many years ago. All the food at the reception was vegetarian finger food. It was lovely! I had forgotten all about the tender filling wrapped in the crisp dough! A marvelous post Lisa! I've never tried making samosas, but I should. I always order them when I'm at an Indian restaurant! They can be so good. These look spectacular - really good recipe. Thanks for this. Your samosas have a unique look to them but the cooking seems perfect. I must find a gluten-free recipe for these. color of a sauce is amazing. 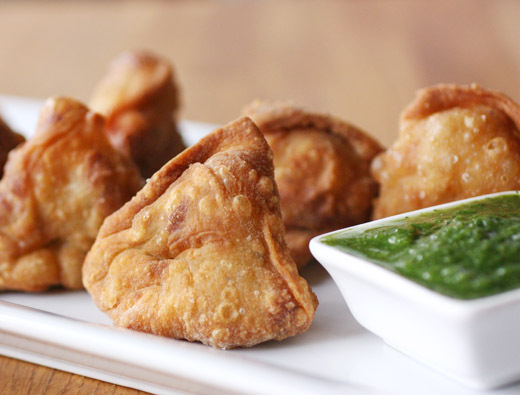 Usually I will just enjoy samosas without the sauce as the sauce usually turns out too salty (referring to store-bought sauce, of course). Yours is a whole package - everything looks too good! WOW! These look sooo delicious. I am a samosa addict. Great recipe. These look so good! Love the dipping sauce too. 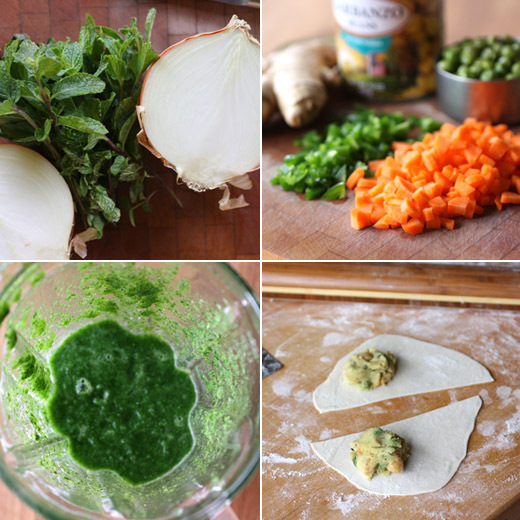 I made samosas a while back but would love to make them again. These look so good.. Made our mouths water!!!! Yummy! I love samosas very much. Sounds good with the addition of chickpeas. Oh wow, they look perfect! I've made a bunch of Indian dishes but still haven't tackled samosas - I really want to though! Love the color of the sauce. Oooh these look soooo good! I have Greg's book and haven't tried the recipes yet but have several bookmarked. 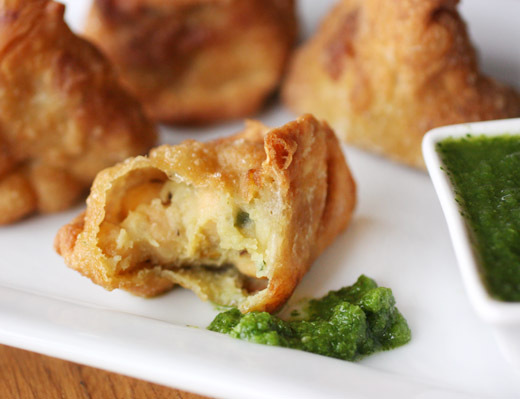 But these samosas? Now I have to try them! But fried? I usually bake samosas but when doesn't frying make something even better? These look outrageous. I am now going to pull the book off the shelf and tuck it into my suitcase for my trip to my mom's.